STEFANIE BOYCE – Speaker. Writer. Spiritual Director. Walking with people going from type A to plan B.
Life’s hard, but so is math. At least it is for me. No, for real. Sometimes, it all doesn’t add up the way we think it should. You know what else doesn’t add up? Hurt. Disappointment. Deep pain. Loss. “If only,” we say. If only things were different. If only they would change. But what if they don’t? What if we can’t fix it, control it, or glue it back together? We all have things that don’t go according to plan. Things that are not working like we’d hoped. Parts of our life that feel out of rhythm, chaotic even. Expectations that have gone unmet, hidden pain we aren’t allowed to share, or ruts we are trying to get out of. The truth is, pain is pain. We all have it. The things that got us here and the intensity of our pain vary greatly, but the process of healing is the same. Whether it’s a season or a life-long amputation we are learning to live with, we are all in process. And, we all have a choice. What do we do when life doesn’t look like we envisioned it would and we can’t change it? We change how we see it. What if the very pain that set out to destroy us was the birthplace of awakening? What if we already have all we need, not to fix the pain, but to transform us in the midst of it? If you’re anything like me, I believed beauty was just on the other side of where I was standing. But now I know it’s right where we are; we just have to train our eyes to see. You can, too. See, that is. Perhaps you just need a reminder or the time and space to cultivate this perspective. I’ve had many guides over the years help me see. Two of the most significant guides are my children, Jayden (2006-2017) and Brooklyn (2009-2018), who passed away from a rare genetic disorder. Through unimaginable loss, God continues to use my circumstances and guides along the way to teach me how to slow down and pay attention to the beauty right in front of me, beauty birthed right in the center of my pain. There is a truth about going from type A to plan B: it invites us to embrace our limitations and the untidy parts of our stories. That requires work. Lots of surrender, vulnerability, laughter, and tears. It’s the only equation that adds up. Only then are we able to be captivated by what God is doing in our life, instead of being held captive by it. There is beauty right where you are. Walk with me scared. Come broken like the rest of us and watch God transform your pain into something beautiful. Watch Him redeem suffering, bring purpose to your pain, and show you things you could never see without it. Take the first step. Let’s stay connected. Stefanie Boyce is a national speaker, spiritual director, and author of two Bible studies designed to help participants create space to be with God and have deep conversations about what they are learning. She is best known for her perspective when it comes to finding beauty in difficult circumstances. In 2009, Stefanie and her husband got the news no parent wants to hear. Not one, but two of their children were diagnosed with a rare, genetic disorder, Sanfilippo Syndrome. Children progress until about the age of three, then slowly lose the ability to walk, talk, feed themselves, and eventually pass away. There is no treatment. No cure. 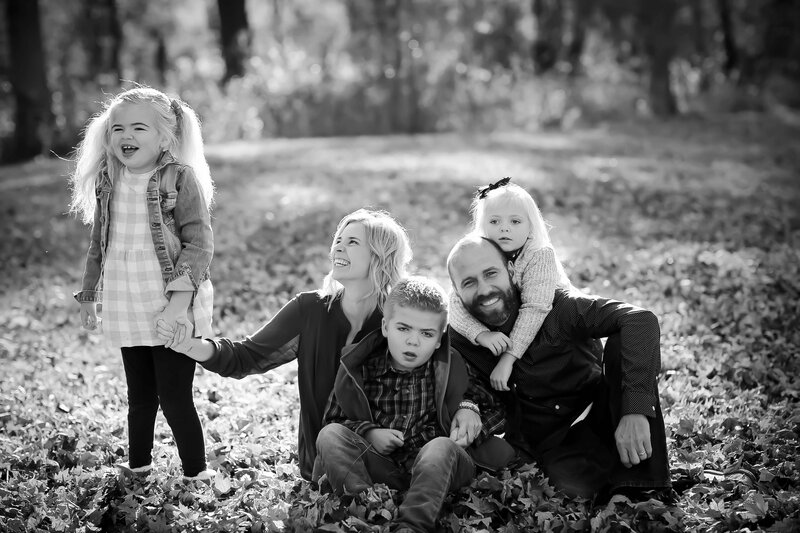 Three years later, knowing the risks associated with having another child, they welcomed their daughter, Elliotte, and began a new part of the journey navigating typical and terminal, simultaneously. In November of 2017, Jayden (11) went home to be with the Lord and just eight months later, their daughter, Brooklyn (9) did too. Committed to thriving, not just surviving, the Boyce’s continue to navigate difficult new normals, always trusting God to reveal the beauty in the midst of such devastation. In Stefanie’s honest, real life approach that people have come to love, audiences have found encouragement, inspiration, and renewed hope. She speaks on a number of topics offering a redemptive perspective on suffering. Through creative teaching, Stefanie uses everyday items and stories to highlight God’s truth. In addition to speaking around the country, her work has been featured in the book, Don’t Do This, The Perennial Gen, and has a number of pieces featured on The Mighty, a digital health community with over 2 million followers. She has been a guest on Melissa Radke’s Podcast, Ordinary People, Ordinary Things, and is currently working on her first book. She also serves as a parent liaison with the JourneyCare pediatric hospice team, getting to sit with other families that are walking a similar journey. It’s one of her most rewarding jobs to date. Stefanie enjoys connecting and holding space for people to grow ever closer to Jesus- whether that is one on one through private spiritual direction, or through writing, teaching, training or keynoting events large and small. She is a wife, forever a mother of three, and dreams of a day she can have a little farmhouse with an old truck to call her own. Connect with Stefanie, invite her to speak, read her blog, and find her on Facebook and Instagram. Stefanie is best known for speaking about seeing life from a fresh perspective, whatever your circumstances, but can work with your specific topic or group. Just let us know what you are thinking when completing the form below. Thank you for considering Stefanie for your next event. What people are saying about Stefanie…. How did you hear about Stefanie? To inquire about Stefanie’s schedule, fees, and availability to speak, please visit her speaking page to complete the request form. Please allow 24 hours to respond. Let’s stay connected! Subscribe today to be the first to hear about upcoming events and resources available to help you transform your pain into something beautiful! If you just wanna say, “Hi” or share your story, please use the form below.